"This recipe requires some time to prepare, but is sensational for a special breakfast or brunch. The torte can be refrigerated overnight and baked before serving." A wonderfully layered breakfast torte! To refrigerate torte overnight, omit the egg wash step. Cover and place in refrigerator. Let stand at room temperature 30 minutes before baking. Brush with egg wash and bake as directed. I serve this for Christmas brunch. 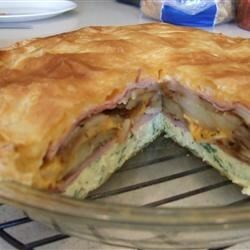 I double the recipe; one pie I make according to the recipe and the other I substitute baby shrimp for the ham. Everyone loves it.